Because we'll automatically diagnose them for you. Never worry about hangs again. Every website experiences hangs. LeanSentry is your insurance policy, reducing the time it takes for you to identify, understand, and resolve hangs whenever they happen. Detects most slowdowns right away. Automatically diagnoses the root cause. Gives you a detailed report so you can get to fixing. I love the LeanSentry's hung request diagnostic! It makes me feel like the black box has become transparent ... and saves a tremendous amount of time. See the things your APM tool will not show you. LeanSentry lets you see deep into the actual operation of your IIS & ASP.NET web stack. We'll help you understand what actually affects your performance and how to keep your sites running their best. Runs safely alongside your existing monitoring. Minimal overhead. Deploys in 5 minutes. Get expert best practices tuned to your apps. We'll tell you if your performance is being limited by suboptimal thread pool usage, .NET garbage collection, IIS concurrency limits, or blocking application code. Then, we'll tell you the best way to fix it. Get the code-level details you need. We'll tell you which code is responsible for your slowdown. Down to line of code, slow SQL query, file path, REST url, and Classic ASP COM call. Stay on top of your hangs. Catch, diagnose, and fix with expert guidance ... without doing any of the hard work. Get deeper insight without adding more overhead. Low overhead monitoring, that can run side-by-side with your existing APM tools. 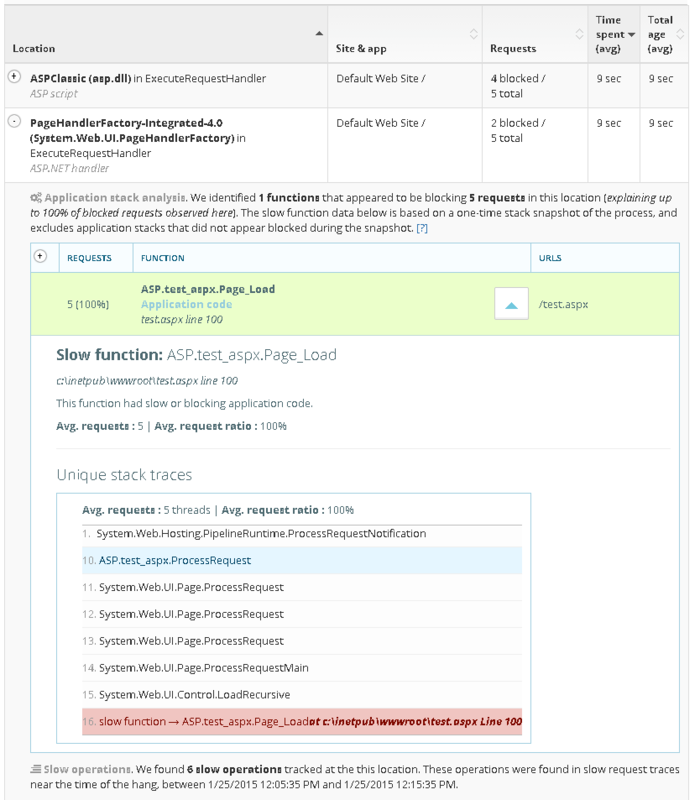 APM tools use profilers that intercept your application's execution. This can destabilize and slow down your apps. LeanSentry uses external, non-intrusive monitoring that combines data from standard Windows logs including IIS logs, ETW traces, performance counters, and so on. This has almost zero overhead on your server and cannot crash or slow down your applications. In the first 3 weeks of use, we resolved 3 production issues affecting performance and availability. LeanSentry is now our go to tool for insight into how our applications are running. Great product & company to work with. Ex MS guys who know IIS and the MS stack. You work with the team directly, not a customer care layer. LeanSentry uncovers things in minutes vs. days of digging. I have not seen a service that provides so much information with so little setup. LeanSentry made it simple to diagnose errors and slowdowns, and gave us a way to measure our success in resolving application issues. We were seeing severe hangs on our ASP.NET site. Looked at what LeanSentry said was the cause of the hang, disabled that code, and it’s been smooth sailing since. Email: Please enter an email.